Sound "Noise is a constant issue with the LT-2XRC, even if your LPs are squeaky clean." "The noise issue aside, what struck me about the LT-2XRC's sound was its smooth yet detailed character. It presented music with a velvety touch, yet without sounding syrupy." However, the LT-2XRC also presented the music with "an homogenized character" -- "I couldnt help but feel that something was missing." Features "The LT-2XRC uses five lasers in total to read the grooves of an LP. Two of the lasers maintain the position of the head, which houses the three "sighting" lasers, directly over the groove." There are "no tonearm- or cartridge-setup issues, no stylus wear or cleaning, no groove wear and the noise that results from it." Use "With an ELP, you can literally play your LPs like CDs" -- "you can skip to other tracks, fast-forward or -reverse, open and close the drawer, even repeat segments." Will not play thick LPs, including some audiophile pressings and 78s, or those whose vinyl is any color other than black. Value An expensive LP-playback system whose value is in its convenience, not its sonic performance. We all know what an oxymoron is, right? A self-contradictory phrase, such as "jumbo shrimp" or "all alone." My favorites are the sarcastic ones -- "military intelligence," "Democratic leadership" and "Republican compassion." As I submitted the "final draft" of this review, I added "laser turntable" to this list. You might even call the ELP LT-2XRC laser turntable "digital analog." Call it what you may, the people at ELP Corporation have designed a turntable that operates like a CD player. It uses lasers rather than the conventional mechanical interface for reading the grooves of our beloved analog LPs -- no small task as I see it. Although Im old enough that my musical roots are firmly grounded in analog, I have both a high-end turntable and a high-end CD player that I enjoy in virtually equal proportions. I also own an equal number of CDs and LPs. Moreover, I do not think that analog is the only acceptable medium or that "digital" is a pejorative word. Finally, while I believe that on well-recorded source material my analog system still has an edge on my digital front-end, that gap has closed considerably over the last few years with some advancements in the "perfect sound forever" format. Now, perhaps the final obliteration of that gap comes with what can be considered the incestuous breeding of digital technology and analog playback -- the ELP LT-2XRC laser turntable. Imagine you've been offered a playback system that literally eliminates a number of the traditional hassles of analog. No tonearm- or cartridge-setup issues, no stylus wear or cleaning, no groove wear and the noise that results from it. My guess is that, all other things being equal, you would jump at the chance to own such a hassle-free analog playback system. Such is the nature and promise of ELPs laser turntables. The ELP LT-2XRC is the most versatile and expensive model ($19,000 USD) in ELPs lineup. The lower-priced models ($15,000 and $17,000, respectively) are limited to standard-sized 33s, 45s and 78s, while LT-2XRC plays records of any size and speed. All of the ELP laser turntables feature the aforementioned list of advantages over traditional turntables, and they also share an advantage almost too oxymoronish for an old analog dog like me to comprehend -- remote playback. Yep, with an ELP, you can literally play your LPs like CDs. Simply insert the LP, sit back in your chair, and hit Play on the remote. You can skip to other tracks, fast-forward or -reverse, open and close the drawer, even repeat segments. For the couch-potato generation, this sort of operation is sure to be a hit. The ELP laser turntable was developed over 20 years ago, during the dawn of the digital era. Its use of a series of lasers to read the grooves of LPs eliminates the friction generated by the stylus/groove interface. ELP calls this "contact-free tracing." The LT-2XRC uses five lasers in total to read the grooves of an LP. Two of the lasers maintain the position of the head, which houses the three "sighting" lasers, directly over the groove. These two lasers read the "shoulders" of the LP; think of the "shoulders" as the rim and the groove as the valley of the Grand Canyon. Of the three remaining lasers, two read the left and right sides of the groove while the final laser maintains proper height and keeps the two reading lasers focused on the groove. The latter lasers send a signal to the Position Sensitive Detectors, which are optical semiconductor position-sensing devices. The variance of the signal or "beam" sent to the PSDs is then converted to an electrical signal. Finally, it should be noted that the LT-2XRC tracks an LP in a linear fashion like a linear-tracking tonearm. Because lacquers are cut this way, such reading of the groove adds yet another advantage to the LT-2XRC's list. Not surprisingly, the LT-2XRC is much easier to setup and install than any traditional analog playback system with which Im familiar. After unpacking the LT-2XRC, you tilt the player on its left side to release the locking mechanism. Next, run interconnects from the unit to your phono stage. Then plug the LT-2XRC in and power it up. From there you insert the platter (packed separately) into the drawer, place the calibration record (provided) on to the platter, press the RPM button until 33.3 appears, and close the drawer. Finally, hold down the power button for a few seconds until the word Cal appears on the display and then release the button. In 30 seconds the LT-2XRC calibrates itself and youre ready to rock and roll. From start to finish, even a novice can set this thing up in no more than 20 minutes. Analog setup just doesnt get any easier. While the unconventional LT-2XRC has many setup and ergonomic advantages over a traditional LP-playback system, it also has a few limitations. First, I was disappointed to learn that the LT-2XRC would not play a large number of my more valuable audiophile LPs due to their relative thicknesses. With four of my Mobile Fidelity 200-gram LPs and a disproportionately large number of my treasured classical 78s, the LT-2XRC produced an error message, Hbnd, indicating that the album was too thick to be read. In addition, if you have any colored vinyl, the LT-2XRC will not play it. Just as Ford advertised, you can have any color as long as it's black. As you'll also read, noise is a constant issue with the LT-2XRC, even if your LPs are squeaky clean. The first LP I played on the LT-2XRC was the Super Disk half-speed-mastered version of Tower of Powers Back to Oakland [Direct Disk Labs SD 16601]. An admitted obsessive compulsive, I have three copies of this LP in near-mint condition. After placing it in the drawer and hitting Play, I immediately noted an unacceptable amount of noise coming through the speakers. This was different than the normal pops and ticks associated with the cartridge/groove interface. This noise was a combination of crunching, popping and distortion that was prominent throughout the frequency spectrum and, therefore, much more distracting than traditional surface noise. Although the ELP manual mentions this potential problem, I didnt expect it to be quite so bothersome. Although I cleaned the LP on my Loricraft PRCM-3 two weeks earlier and thoroughly dusted it off with my Hunt carbon-fiber record brush right before playing it, I decided to clean it again on the Loricraft just to be safe. What struck me as odd, however, is that Id played this LP just a few days earlier on my SME turntable, and it was virtually dead quiet. I re-inserted the re-cleaned LP, hoping to hear a noticeable improvement. To my dismay, it sounded the same. So I decided to try my other Super Disk versions of this LP. Again, I cleaned them on the Loricraft and, again, there was an unacceptable level of noise both in scope and volume. Loudspeakers  Kharma Exquisite 1D-E.d. Power amplifiers  Lamm M1.2 Reference and Tenor Audio HP-300 monoblocks. Digital  Reimyo CDP-777 CD player. Analog  SME Model 30 turntable, SME Series IV.Vi tonearm, Dynavector XV-1s cartridge, Aesthetix Io Signature phono stage. Interconnects  Silversmith Palladium and Kharma Enigma. Speaker cables  Kharma Enigma (custom designed for the speakers). Power cords  Harmonix X-DC Studio Master. Accessories  Reimyo ALS -777 power conditioner, Arcici Suspense rack, Silent Running Audio Ohio Class XL Plus and VR-series platforms, Wattgate 381 and FIM outlets; Loricraft PRCM-3 LP-cleaning machine. In an effort to mitigate this annoyance, I turned to the manual, which offered a few suggestions for addressing the issue. It suggested re-calibrating the LT-2XRC if it skips on tracks normally played without problem. Although I was more concerned with the noise, the LT-2XRC had skipped on one track (abnormal for this LP), so I re-calibrated the turntable. Unfortunately, it didnt help. The LT-2XRC has a built-in Noise Blanker circuit, which ELP claims "reduces the annoying ticks and pops caused by dirt or record imperfections." It can also be turned off. Assuming that the Noise Blanker may have been disengaged, I was convinced that Id found the problem. However, the Noise Blanker had been engaged. Another dead end. 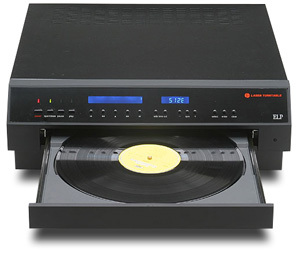 Finally, the ELP turntable has what is called a Variable Scanner Offset (VSO) system. The manual claims the VSO system allows adjustment of the laser beams' spacing for optimum reproduction. In essence, the laser can be adjusted to read a different portion of the groove, one that is presumably cleaner or less damaged than that read by a conventional mechanical stylus which, the manual states, "can only read a limited area of the record groove." Encouraged by this potential solution, I proceeded to adjust the laser angle using all four available VSO system settings (ranging between 1 and 6 mils). These adjustments not only failed to reduce the noise, but the LT-2XRC now skipped like crazy. I played a few other reference LPs hoping that the level of noise on my three Back to Oakland LPs was an aberration. Sadly, it wasnt. The noise was present on all of the LPs I played to some degree. In each case this noise was worse than when the LPs were played on a conventional turntable. My cherished classical 78s, when not too thick to play, were also too noisy to enjoy. At this point, acknowledging that this distracting noise was here to stay, I decided to listen through it in hope of getting to the music at hand. The noise issue aside, what struck me about the LT-2XRC's sound was its smooth yet detailed character. It presented music with a velvety touch, yet without sounding syrupy. There was no glare or harshness. Indeed, there was good balance across the frequency spectrum, with the LT-2XRC sounding neither forward nor polite. However, I couldnt help but feel that something was missing. The sound wasnt quite right, and I couldnt put my finger on why. Another long-time reference album, Bobby Lyles Ivory Dreams [Atlantic 81938-1], confirmed the LT-2XRCs even-handed approach. But while Lyles Bösendorfer had plenty of presence and slam, something was amiss with the bass line. Again, while the LP sounded good, it just seemed like a piece of the sonic puzzle was missing. I dug out an audiophile pressing of Chicagos debut album, Chicago Transit Authority [Mobile Fidelity Sound Labs 2-128]. Ive heard this LP hundreds of times. Through the ELP turntable, the presentation was slightly more subdued than usual, but it still had good impact and presence. Now, however, I began to realize what was missing. Peter Ceteras bass line didnt have the pitch, harmonic texture, or definition I knew it did have. At this point I decided to do some comparing to determine if my hunch was correct. For obvious reasons, I began by playing Back to Oakland on my SME 30 Model turntable/SME Series IV.Vi tonearm/Dynavector XV-1s cartridge setup, which costs roughly $27,000. As expected, it was dead quiet with no noise to distract me. Dave Garibaldis drums and Rocco Prestias bass on "Dont Change Horses in the Middle of a Stream" and "Squib Cakes" also had better transient attack, bloom and decay through the SME/Dynavector combo. For example, when a bassist plays a single note on the string of his bass or a percussionist strikes a tympani, there is an initial sharp and pronounced attack (whether a muted or staccato note), followed by the development or bloom (as the skin or string and wood resonate), and ending in a natural decay of the note's trailing harmonics. Through the LT-2XRC, the attack and subsequent harmonic bloom of the notes were less pronounced, giving the music an homogenized character. When Tower of Powers bass virtuoso Rocco Prestia played in his rapid-fire finger-funk style, and when Peter Cetera pulled harder on his strings, their respective playing styles were easier to hear through my reference analog rig. With Chicago Transit Authority LP, my listening notes further indicated that Terry Kaths voice was more gruff, raspy and soulful through the SME/Dynavector rig. To the average guy on the street these differences might be considered minor or inaudible. But, heck, were audiophiles here, and to us these subtle nuances are what make music, well, music. On album after album, the LT-2XRC, while pleasant-sounding and full-bodied in its presentation, continued to homogenize the sound of each LP. Compared to my reference rig, the ELP turntable just didnt give me as much insight into the music or, for that matter, the individuality of each performers style. I also sensed that the upper frequencies of the SME/Dynavector rig sounded faster and livelier than those of the LT-2XRC. Macrodynamics and detail were present with the LT-2XRC, but in my system the music lacked microdynamics, subtle nuances, liveliness and speed. Again, my reference rig was simply more physical and alive in its presentation. What I did discover, however, was that on poorly recorded or bright-sounding LPs, the LT-2XRCs velvety presentation ameliorated any maladies and made these LPs easier to listen to. The SME/Dynavector combo, on the other hand, gave me the good, the bad, and the ugly. I sincerely admire the design of the ELP LT-2XRC. Its technology is ingenious and its list of setup and ergonomic advantages over traditional LP-playback systems are numerous. The ability to play LPs and use a remote control to move from track to track will appeal to most every audiophile, as will the concept of zero record wear. Sonically, the ELP laser turntable has a well-balanced and velvety presentation. It has plenty of macro detail and slam while not being forward in its presentation. However, in my time with it, the ELP turntable caused a disproportionate amount of what were otherwise silent LPs to sound as if theyd been stored in a sandbox. In addition, the LT-2XRC will not play 200-gram LPs and some 78s, as well as those that are not black. Finally, at least compared to my SME/Dynavector analog rig, the music sounded more homogenized with less of the subtle nuances -- such as the attack, bloom and decay of each note -- that make music enjoyable. These may be minor issues to some listeners and worth dealing with because of the LT-2XRCs many advantages. I have read various theories in support of the ELP turntables superiority and, conversely, understand well the mechanics of the traditional approach to playing LPs. While I am admittedly not an engineer I can only surmise that because the LP is a "physical" medium, with grooves originally designed to be read by a stylus plowing through them, altering this aspect departs radically from an LP's intended use. Therefore, the ELP LT-2XRC may be presenting music from LPs differently and not necessarily in the way it was intended to be -- and not the way in which it sounds best. My experience with this innovative playback device bears this out. We, the staff at Audio Turntable Ltd., were sorry to learn about your bad luck with the Tower of Power Back to Oakland LP. Although we do not have the Super Disk version, we did find an old, beat-up copy of the original Warner Brothers release, which we played on the very LT-2XRC you returned to us. Needless to say it sounds great with very few pops and clicks despite being played many times and scratched throughout. Firstly, in order to be certain of this finding, we tested 200-gram and thick LPs on the very turntable you used for the review. They played just fine. We have hundreds of 200-gram records from Classic Records and Mobile Fidelity and welcome you to send us one of the copies you have of Back to Oakland and the four 200-gram records you refer to in order for us to examine. It is important to us to find out why they did not work for you. After reading your review, we contacted Mr. Chiba, the president of ELP Corporation, and asked him if there was any height or thickness restriction that the Laser Turntable could not play. He stated that there was not, with the exception of the old Edison discs which are half-inch thick or more. In fact, we make it our mission to find records the Laser Turntable wont play. To date, we have found only one 78 out of 1000 which could not be played, and of course all clear or colored vinyl, though nothing else. We own over 10,000 LPs, 1000 78s and thousands of 45s and, indeed, we have tested almost all of them over the last year. They unanimously play well. Secondly, pops and clicks! Yes, we agree that more often than not the Laser Turntable picks up pops and clicks on most new records, but not so much with older ones. That is due to the fact that the laser reads everything. Under a microscope one can see what the Laser Turntable picks up that the stylus does not. Certain imperfections, improper record cleaning or a very dry, static-filled environment increases the probability of hearing the pops and clicks. On the other hand, if the record is properly cleaned, in a suitable environment, there are minimal pops. We have found that most newly pressed records today seem to have more pops and clicks than older records. Records from the late '50s to early '80s seem to sound best. Furthermore, relative to a conventional turntable, scratched records always sound better on the Laser Turntable. In addition, customers are asked to bring in their worst, scratched, unplayable records to listen to on the Laser Turntable. The Laser Turntable plays them all with ease and records sound great despite being scratched. We did not find that the Laser Turntable "ameliorated any maladies," and instead reads the scratches or imperfections faster than a stylus without physical mass or inertia coming into play. Therefore, no scratches are heard, only tiny pops and clicks. Thirdly, the matter of the sound or lack there of! There is nothing missing with the Laser Turntable; rather there is something missing with the cartridge, and that which is missing is what audiophiles have not knowingly grown to like. This explains the musics micro-nuances heard with the Laser Turntable, which would never be depicted with the stylus. Think about what the stylus is not reading from the record that the laser does! On one hand, the stylus involves mass and inertia of the cantilever and magnet or coil. On the other hand, light photons have no mass, which signifies that the Laser Turntable has an almost infinite transient response. Indeed, a moving magnet is like driving a 4000-pound sedan on a mountain road; and a moving coil is like driving a 2000-pound sports car on the same road. The Laser Turntable is rather like a sport bike with tires that never slip, but even faster! Tubes are popular because they are asymmetrical in their harmonic response; however, the asymmetry emphasizes the even-order harmonics, which the human ear finds very pleasant. Hence tubes are more "musical," nevertheless not more accurate. All record systems have harmonics, because there are resonances in both electrical and mechanical players. The laser is absolutely unique in that light has no resonance. Thus, the harmonics are always right and uncolored. Styli can make poor recordings sound good due to the harmonic distortion, hence the exaggerated "trailing harmonics" you heard. The Laser Turntable is the equivalent of solid-state for records, and styli are the equivalent of tubes in that they "smooth over the noise, and color the sound with their own resonance." This may cause some music to have more "harmonic texture, or definition" and "better transient attack, bloom and decay." With a conventional turntable there are many factors that could affect the sound by the time it gets to ones ears. The opposite is true with the Laser Turntable. It processes every record in the same manner, efficiently and with accuracy every time, consequently producing the "homogenized character" and "velvety presentation" you noted. There is no question that the Laser Turntable brings you to a purer form of music than any other media, without coloration, or additional content. Several master-tape A-to-B comparisons have demonstrated this fact. The Laser Turntable without any doubt sounds closest to the original tape. We invite you to come visit us at the Rocky Mountain Audio Fest, where we will be happy to demonstrate this to you. Finally, the reference system! In your review, the Laser Turntable is compared to only one reference system, the "SME 30 Model turntable/SME Series IV.Vi tonearm/Dynavector XV-1s cartridge setup, which costs roughly $27,000." As expected, the latter sounds better. We would never claim to oust the sound from a setup that is twice the price; however, weigh it against systems of similar value, and the Laser Turntable beats them all every time. We also would never expect old analog hounds to replace their conventional turntable setup with a Laser Turntable, though simply to add the Laser Turntable to their existing arrangement, while giving them the best of both worlds. The analog world is universally a better place, due to the many different products on the market. Nonetheless, the Laser Turntable is positively the most radical and unique invention that one can invest in for a truly diverse musical experience. Many others have had an as beautiful experience as we have listening to the Laser Turntable and the unique perspectives it unveils of the analog record. The Staff at Audio Turntable Ltd.